Texas Parks & Wildlife uses words and images to inspire and educate readers and encourage understanding, enjoyment and conservation of Texas’ natural and cultural resources. Texas Parks & Wildlife is your guide to the Texas outdoors. Each issue of this award-winning magazine is packed with outstanding color photos and articles about every facet of outdoor recreation: fishing, hunting, camping, birding, boating, traveling and more. Texas Parks & Wildlife brings you information about state parks, environmental issues and events taking place all across the state. 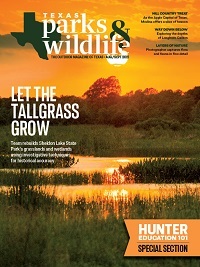 Texas Parks & Wildlife truly is a magazine for all outdoors. Texas Parks & Wildlife uses words and images to inspire and educate readers and encourage understanding. enjoyment and conservation of Texas’ natural and cultural resources.